Heartbreaking and gripping, Gabe’s story was intensely emotional, volatile and raw and I found myself consumed by every dark minute of it. Another great addition to the Ruin series. I have loved this series so much. I love the characters both as individuals and as a group. The dynamic is real and deep, each with an intriguing story to tell, pain and secrets to carry, and a love — both of a friend and of a lover — to heal the shattered parts of themselves. Gabe’s story is one defined by pain, guilt and darkness. I had no idea how profoundly he was broken, how powerfully his emotions raged within. Gabe is such a tortured character, leading a duplicitous life not only externally, but also internally. One of the aspects I was so moved by was seeing the facets of his persona externalize … jarring juxtapositions as the different sides of him personify what he’s feeling at any given time. His pain was raw and as a reader, I felt that. I was moved by it. There’s an element of mystery as well I tried to unravel the secrets of which he held so tightly. Rachel Van Dyken does a great job of giving you small morsels of information to give us just enough to keep us riveted. This is my fourth RVD book and one irrevocable fact is that this author does a masterful job at captivating the reader, creating page turners that keep us begging for more. 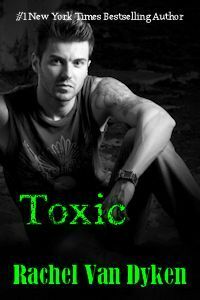 Toxic consumed me from beginning to end and although it can be read as a standalone, even now, I’m not ready to let this cast of characters go. But I digress… Gabe’s story. We begin in present tense and work our way back in time to understand the events that have led him to a place of utter desolation. Gabe’s life changed after Wes Michaels almost died. Seeing the person that became his best friend embrace life so fully and then be pushed to the brink of death showed him that he had to want more for himself. It also reminded him just how fragile life was … a fact he knew too well. Gabe is a complex individual who lives a life that’s been marred by a tragedy he’s forced to recall every day. There’s no escaping it and even years later, the wound feels fresh. In addition to this scarring event, he must hide from his father who has used him his whole life. For money. For success. For living the life his dad feels should’ve been his. So he must wear a facade and hide his true self, physically and metaphorically… and the more he hides, the more he loses himself. With so many emotions inside, he feels like he’s constantly shattering, perhaps into too many pieces to be recognizable. Salvageable. Saylor has been focused on using her education to secure a job that will support her family. Her life hasn’t been her own in so long, dedicated to what must be done. Her love is music, but her efforts are honed in on the mechanics, but lack the passion to flourish … much like her life. When she unexpectedly bumps in to a tattooed guy that is passion personified, pouring what is clearly anger and sadness into the keys of a piano, she is entranced. But he quickly breaks the spell when he berates her and then just as suddenly crushes his lips on hers. Gabe’s only therapy is music, but it’s been a therapy he’s denied himself for so long. He’s chosen the facade, and music is a part of the reality he’s forsaken. His emotions are constantly at war … feelings of abandonment, being left behind, worthiness and emptiness battle to the point of destruction. He’s sure he can never and will never love again. So in the past, he’s used women, but felt nothing. And even that ceased after Wes’ surgery. But when this girl bumps into him, he’s so unsettled and taken aback that he can’t help but get a taste of her and now, he can’t stop thinking of her. Fate has a knack for thrusting these two unlikely people together and the more they get to know each other, the more they realize they have more in common than they thought. Their life experiences, although drastically different, also share similar pain with a similar release through music. But it’s Gabe’s mercurial ways that leaves Saylor hurt, confused and angry. There was so much more than met the eye, of that she was certain, but every time she was with him, his words were a lance through her fragile heart. As the truth becomes known, we see just how amazing Gabe is. How vulnerable he is. How much love he has to give despite the fact that he feels he doesn’t deserve it in return. My heart broke for Gabe, for everything he carried so heavily on his shoulders. I better understood his reactions and could feel how deeply he was falling for Saylor. Saylor knew that the way to understand Gabe was not through the words he was so afraid to reveal, but through notes of music, through the sound of his voice baring his soul. This was simply a beautiful, heartfelt and wholly captivating book. It’s a story that shows you just how much our hearts can be crushed unexpectedly, how the friendships we’re blessed to have can save you in more ways than one, and how a patient and understanding love can heal even the rawest of wounds. I loved seeing so much Wes and Kiersten in this book and loved seeing how they all interacted as a group of characters … a group of friends. I look forward to reading Fearless, the continuation of Wes and Kiersten’s story out very soon! Click on the below cover image to purchase from Amazon.